Taking advantage of market growth opportunities means having the right processes in place to move fast and efficiently. 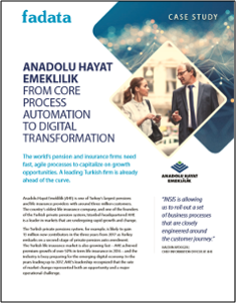 Read how Anadolu Hayat Emeklilik, a leading provider in the rapidly developing Turkish pensions and life insurance market, transformed its core business processes to align with evolving digital customer journeys, take advantage of regulatory change, and stay competitive. The result? Improved speed to market, automation of key processes, integration with high-volume digital self-service channels, and marked improvements in operational efficiency.